Yesterday I was working on the plank wall in the dining room. It’s looking great, and now I just have to pick out a bunch of slivers from my hands! As I kept going in and out my front door to get boards cut in the garage, I realized I don’t have anything hanging on my front door. I usually have a wreath, but I didn’t put my spring wreath up from last year because we had a bunch of moths make a home in it. So it was time to make a new one, but I thought this was a great time to use up some more left-over fabric and make a cute pennant instead of a wreath. 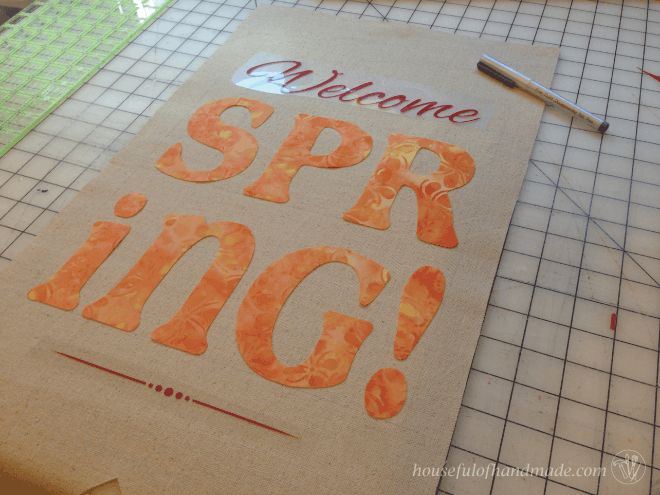 So to start, you’ll need a thick, canvas fabric (I used left over drop cloth), some heat transfer vinyl, cute printed fabric, coordinating thread, and Wonder Under (or other paper backed fusible web). I cut my pennant piece out of my drop cloth. I cut it 12 inches wide by 24 inches long. 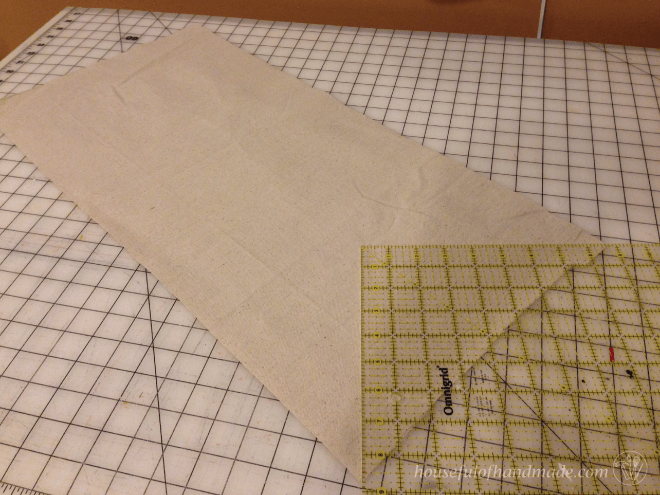 Then I placed my square quilting ruler on the bottom and cut out the decorative bottom. I measured how much room was in the area I wanted the wording and then went to my computer to design it. I used my Silhouette cutting machine to design and cut out my letters. 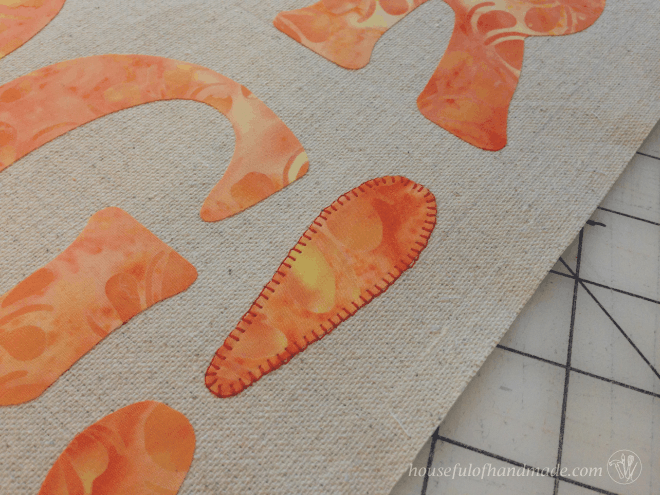 You can do it without a Silhouette, you will just have to hand cut out the fabric letters then use fabric paint or a Sharpie instead of the heat transfer vinyl. 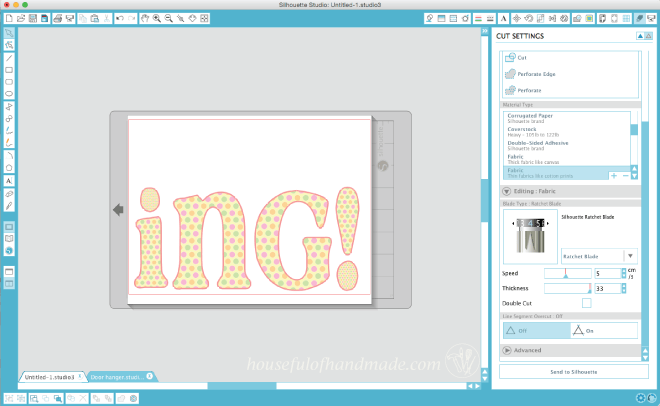 When I design in my Silhouette program, I always change my design board to the total size of my craft, even though it is bigger than my cutting area (don’t worry, I’ll show you how I cut it out in a minute). 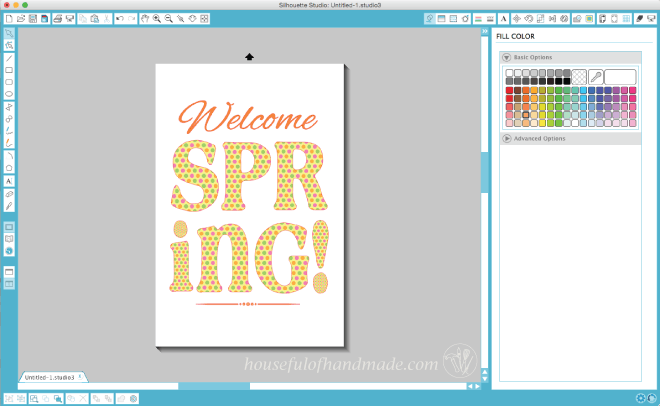 The fonts I used are Alex Brush for Welcome and Cafe Rojo for Spring. I designed it so that I would cut the chunky letters out of fabric and use heat transfer vinyl for the thinner ones. 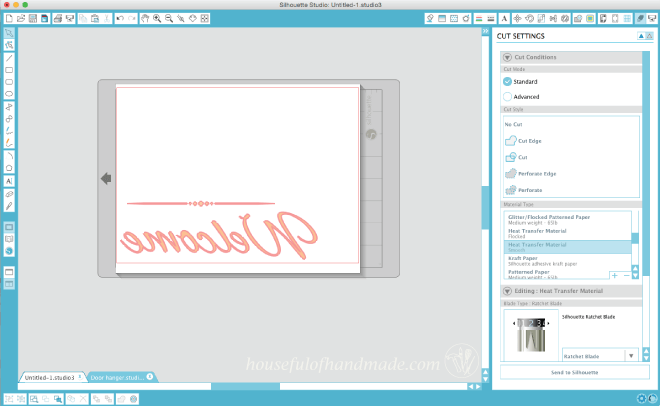 Once I have my design how I want it, I copy and paste the designs I wanted cut out of heat transfer vinyl to a new file sized to my cut area. 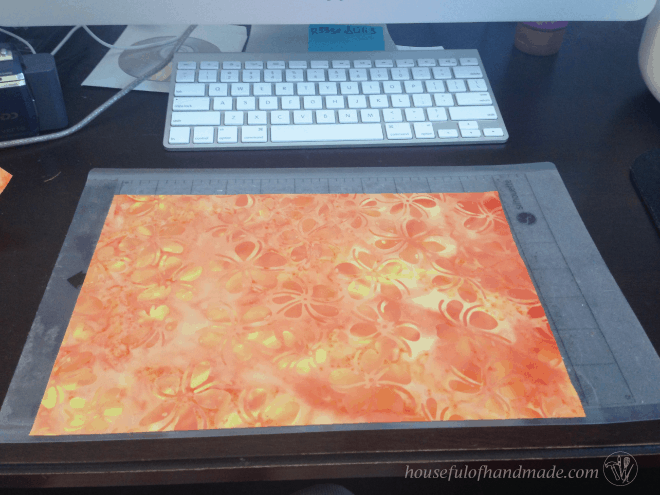 I am using the cutting mat for my vinyl since I am using a small scrap. When you cut heat transfer vinyl you have to mirror your image because it cuts from the back. Then get ready to cut. I used the standard heat transfer material setting in the Silhouette program. After I cut my heat transfer material, I got ready to cut the fabric. 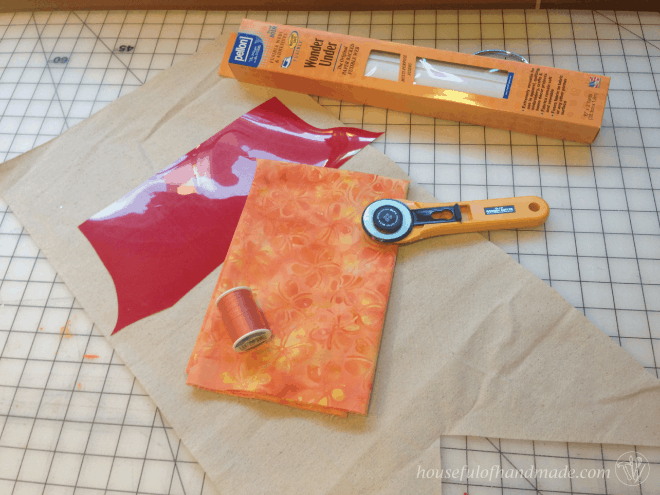 You need to prepare your fabric for cutting, cut out 2 pieces of fabric and 2 pieces of Wonder Under 7″ x 11″. 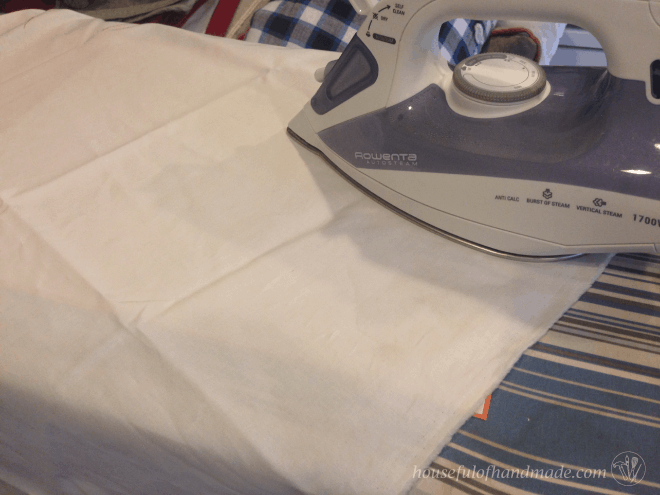 Place the fusible side of the Wonder Under on the back side of your fabric and iron it with a hot, dry iron (no steam!). When ironing anything fusible, I highly recommend using a pressing cloth. I have a piece of scrap muslin that I use for my pressing cloth, it just protects your iron from accidentally getting fusible things stuck to it. 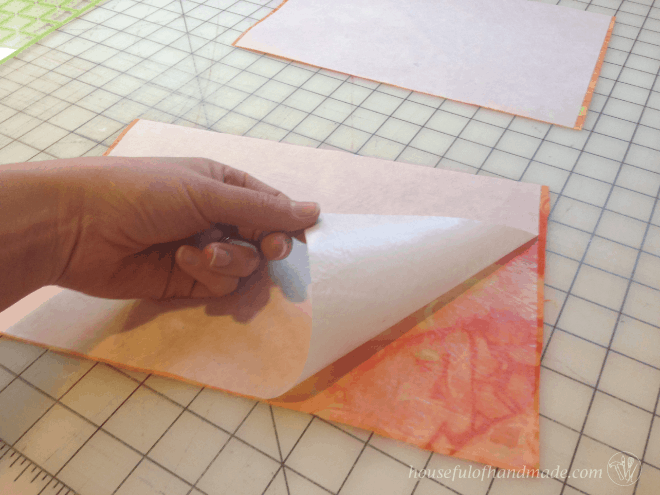 Peel the paper backing off the Wonder Under and discard. You will have a film stuck to the back of your fabric. Don’t let this get hot, cause it will fuse to whatever it is touching if it does! 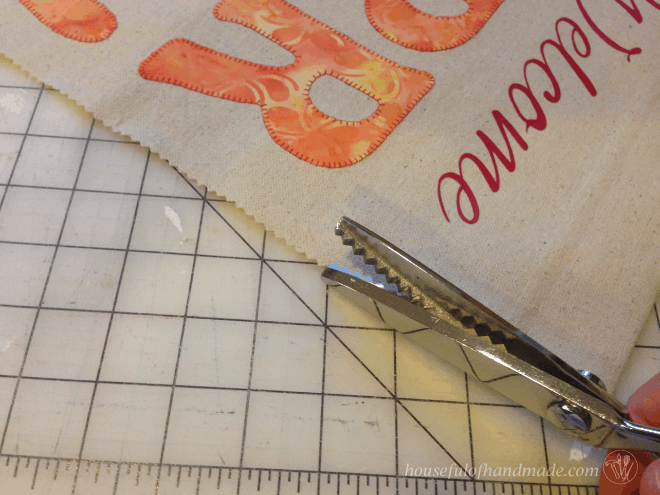 Press the fusible side of your fabric onto your cutting mat and then prepare your file for cutting. I copy and pasted half of the Spring since that is all that would fit on my cut area. Then I cut out my fabric using the thin cotton Fabric setting in the Silhouette software, but I did change the blade setting to 4 instead of 3. Then cut it out! And do the same with the rest of the fabric letters. 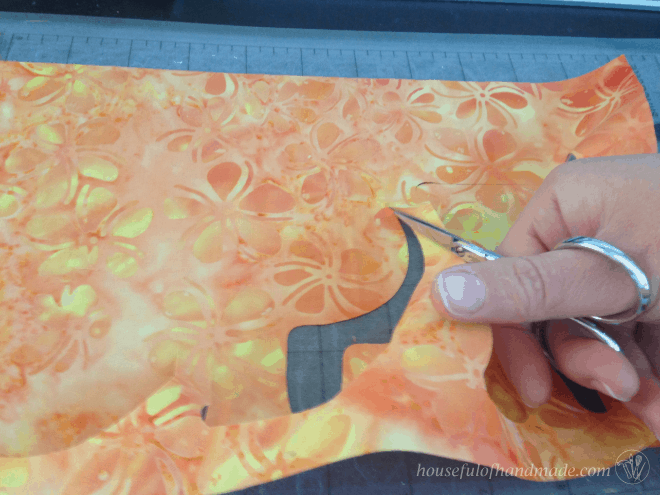 When I pull the fabric off my cutting mat, I have my snips handy, occasionally there will be a fiber of the fabric that is missed by the blade and you will just need to snip it. If you slowly remove the fabric you can catch any little fibers that need cutting without accidentally pulling it and fraying your beautifully cut fabric. Now that everything is cut out, you can lay it out on your pennant. I use my disappearing fabric pen to draw some guidelines on the pennant to ensure everything is centered and lined up straight! Don’t worry, it will disappear in less than a day. Go back to your iron, with your pressing cloth of course, and using the same hot, dry iron, give everything a good pressing. Let it cool down a little and then you can remove the plastic from the top of your heat transfer vinyl. 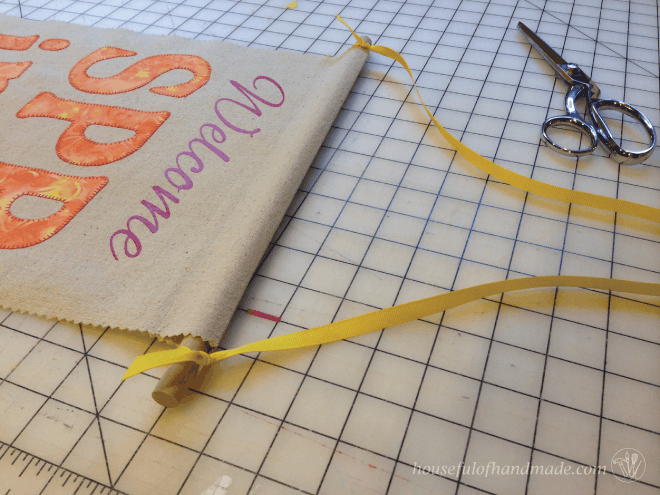 You can leave the fabric as is, or go ahead and stitch around each letter with a blanket stitch like I did. I used red thread to tie in the red of the vinyl. 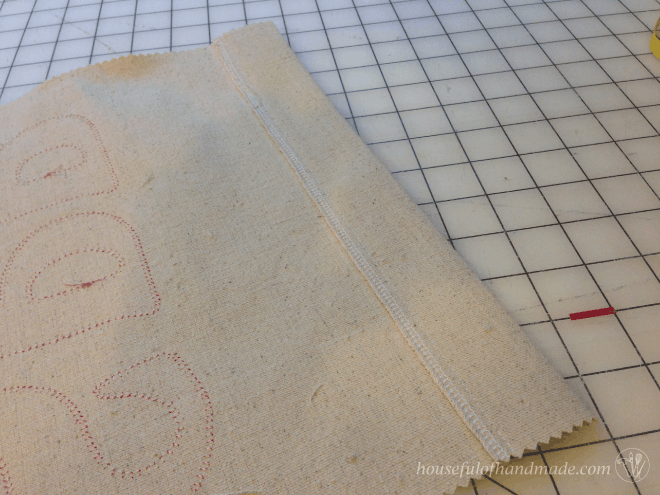 My trick to making a clean blanket stitch around the letters is to GO SLOW! My machine has a feature where I can chose to have my needle always stop in the down position which is helpful and then I slowly turn around the curves. Slowly sew 1-2 stitches, then turn, 1-2 stitches, then turn. It takes a little time, but is definitely quicker than hand stitching it. When all my letters were stitched around, I used my pinking shears to trim the edges of my pennant. This will help it from fraying. Then I sewed a 2 inch pocket on the top of the pennant, leaving the sides open. I cut a 1/2 inch dowel so that it was 2 inches larger than my pennant (1 inch of overhang on each sign) and inserted it into the pocket. Then finished it off by tying my ribbon on each end. And now you are ready to hang it! Super cute! I love DIY anything lol. Love it, pinned it, sharing it! Nice to meet a fellow DIY addict 🙂 Thanks for sharing! I’ve got a little bitty flag holder that would be perfect for a sweet little flag like this! Thanks so much for the tutorial and the inspiration. This would be perfect for a little flag holder Ashley! This is so cute! My mom loves getting new pendants for her little flag holder in the garden… I bet I could make her a few custom flags with this idea! Thanks for linking up at Welcome Home Wednesdays… I loved your post so much I’m sharing it tomorrow in my Fantastic Finds Round-Up! I can’t wait to see what you share with us next week! This is SO cute! Good job. Might have to make one of those! Love this, Katie, and thanks for the great Tutorial! I am sooooooooooooo ready to Welcome Spring! You are really making me want a Silhouette! This is such a cute idea. I always have a wreath on my front door, but it would be fun to mix it up with something bright like this. I really hope you get one someday! They really are a game changer for crafting. I love that this is so light and doesn’t bang against the door during our crazy spring storms. Kati, This pennant is adorable! Love the fabric you used and it looks great on the door. Pinned, tweeted and a g+ share. Have a great week and thanks so much for being a part of Brag About It! Have a great week. This is really fun and looks bright and happy! Love it! I love the colours you chose for Spring! 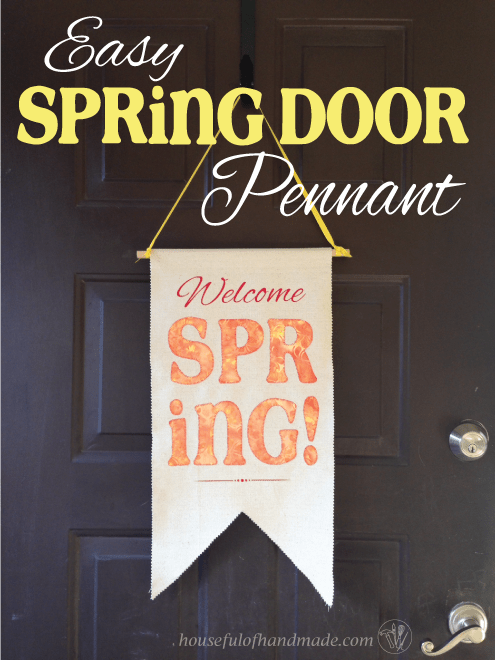 What a cute door pennant! Love the extra details around the lettering! Thanks Coco! I had lots of fun putting it together.